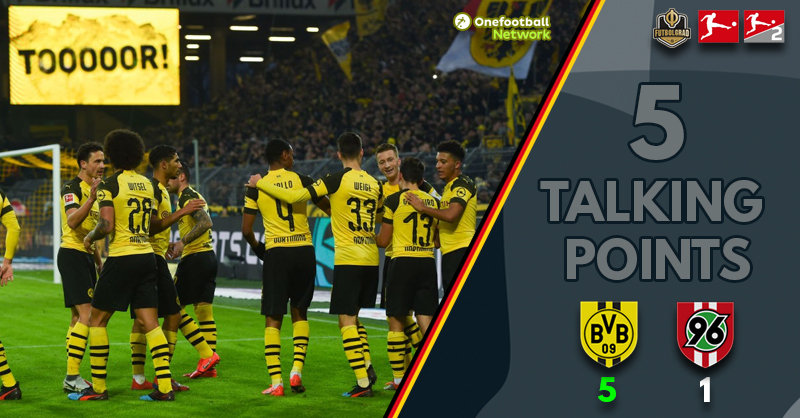 SIGNAL IDUNA Park – Dortmund v Hannover – Borussia Dortmund demolished Hannover 5-1 at the Signal Iduna Park in a result that was rarely in doubt. Goals to Achraf Hakimi, Marco Reus, Mario Götze, Raphael Guerreiro and Axel Witsel got it done with the only blemish being a deflected strike from Marvin Bakalorz. This match always threatened to be a blowout and so it proved, the Bundesliga leaders putting relegation candidates Hannover to the sword with a 5-1 thrashing. The visitors equipped themselves well in the early stages but failed to heed the warnings after Marco Reus fired over and then hit the post. A lovely move from Raphaël Guerreiro and Achraf Hakimi saw the left-back unleash an unstoppable strike to put Dortmund 1-0 up at the break. 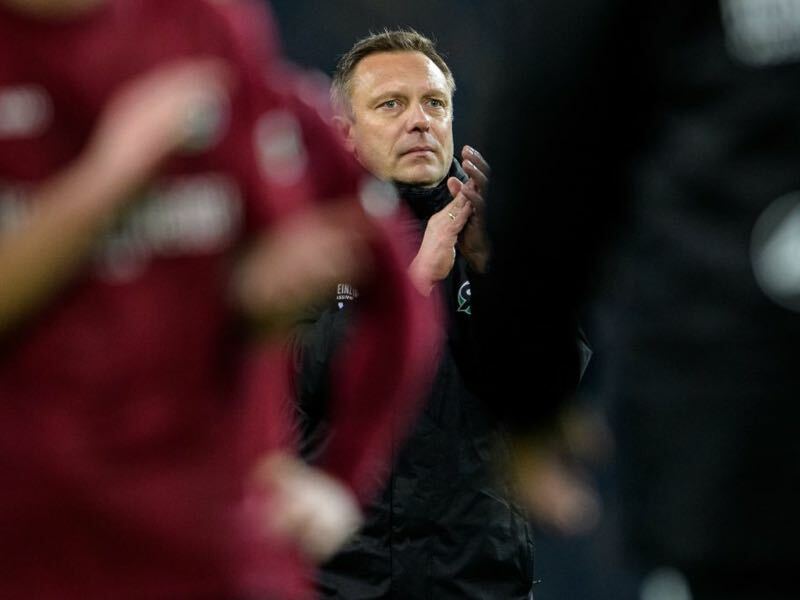 Hannover might have thought they were in the game but whatever manager André Breitenreiter said at half-time went out the window in seven crucial minutes. Hannover were the architects of their own demise with some suicidal defending, Miiko Albornoz the first culprit as he was inexplicably robbed by Hakimi who set up Reus who made it 2-0. Götze and Guerreiro then put the result beyond doubt at 4-0 before a shell shocked Hannover knew what hit them. A deflected strike from Marvin Bakalorz took some shine off the win, but Axel Witsel tried his luck from distance and hit the jackpot with the last kick of the game. Dortmund did what they have done so many times this season, keeping the opposition at arm’s length before delivering the knockout blows in the second half. Don’t be fooled into thinking Dortmund played at their best. It was far from it, especially in the opening 20 minutes with a number of misplaced passes and sloppy turnovers. A better side than Hannover might have punished them, but the visitors were largely toothless and don’t have the weapons to create or score the necessary goals. Mario Götze is far from an ideal striker, nowhere near the level of Paco Alcácer who hasn’t been fully fit in the six months since moving to Dortmund. Julian Weigl has been equipping himself well in an unfamiliar position due to injuries sustained by Manuel Akanji and Dan-Axel Zagadou, but was guilty of a number of misplaced passes and could have done more to prevent Bakalorz’s consolation goal. It’s a scary proposition for Bayern München and the rest of the chasing pack. Lucien Favre’s side have had so much room for improvement since the beginning of the season and continue to do so. If they can find the extra gears and limit the preventable mistakes, not even a Bayern resurgence is likely to stop the Black and Yellows claiming their first Bundesliga title since 2011/12. Achraf Hakimi’s performance was symptomatic of Dortmund as a whole, some shaky moments that almost led to disaster mixed with brilliance that led to goals. A bad turnover in the early stages saw the left-back pick up a yellow card but then the Real Madrid loanee started and finished a lovely move that put Dortmund into the lead. Another turnover was followed by some crucial interceptions, the 20-year-old then caught in possession in his own half when trying to beat a number of Hannover players on the dribble. Hakimi showed his class in the 2nd half however, punishing a careless Miiko Albornoz and squaring to Marco Reus who made it 2-0 which opened the floodgates. Hakimi started the show but there were significant contributions from Dortmund’s stars including Marco Reus, Jadon Sancho and Axel Witsel. Sancho was a handful for Matthias Ostrzolek early on before getting plenty of joy against Kevin Akpoguma in the second half. The 18-year-old set up Götze when most players would have taken a shot, securing his second assist in the dying minutes after setting up Witsel. Sancho is going from strength to strength this season, his technical ability and decision making is just incredible for such a young and inexperienced player. Speaking of Witsel, it was evident in the opening games of the season what a quality player he is and how important he would be for Dortmund. It’s evident in every match and he is such an important player that he simply must remain injury free for the remainder of the season. Reus did what Reus does, a constant danger every time he is on the ball and clearly the most talented player on the pitch. Reus is always a joy to watch and most neutrals must be hoping to see him lift the Bundesliga title in May. Shout outs to Lukasz Piszczek and Raphael Guerreiro who were excellent and Mario Götze who took his goal well. Hannover fell into the trap of thinking they could compete with Dortmund, and once they tried to press high the visitors became spread out and were ripe for the picking. The way in which Hannover lost their shape and fell apart in the 2nd half was a sign of a team that is clueless and devoid of confidence. Hannover simply fell apart and if they are playing Bundesliga football next season it will be a minor miracle. This is a poorly assembled squad and injuries to key attacking players such as Linton Maina, Ihlas Bebou and Niclas Füllkrug was always going to be a recipe for disaster. André Breitenreiter is on the chopping block and it would be no surprise if this was his last match in charge.